Concerned citizens crowded Lompoc City Hall on Jan. 8, when the City Council held a special meeting to fill a vacant seat on its dais. After a half hour of wrangling over the appointment procedure, newly elected Mayor Jenelle Osborne opened the floor for public comment on who would serve the remaining two years of her vacated term as an at-large council member. Resident Sandy Higley was the first to speak. "If this is to be truly representative of Lompoc," she said, "I hope that it would not be another white male." Spontaneous cheers and applause erupted from the crowd. 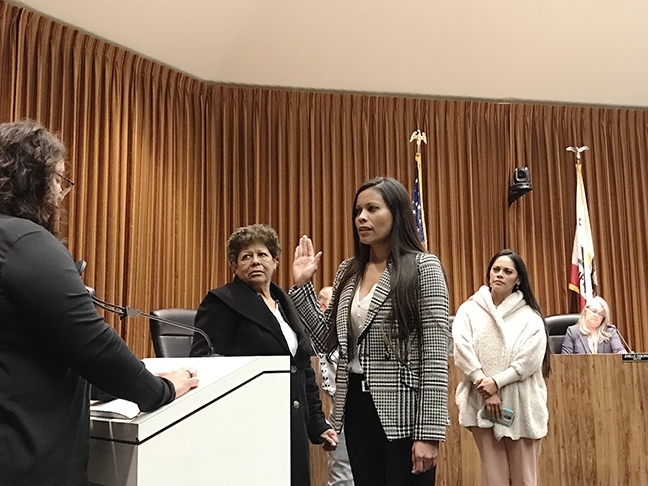 Although the mayor admonished the applause, the council ultimately aligned with Higley's wish by appointing Gilda Cordova, a self-employed Latina in the hospitality industry, to serve on the council through 2020. Despite being a city that has a Latino population of 56.7 percent (according to the U.S. Census Bureau) Lompoc has had very few non-white representatives on the City Council. With her appointment, Cordova joins recently re-elected incumbent Victor Vega as the only two Latino voices on the council. "Education, housing, and job availability are the most important things," she said. "If you're not at the table, your voice isn't heard. That's what I'm trying my hardest to give." Lompoc City Clerk Stacey Haddon administers the oath of office to newly appointed City Council member Gilda Cordova as her mother, Gilda Sosa, and sister, Dominique Garcia, offer their support. In all, 10 city residents filed applications to offer their voices to the council. With her 20 years of experience managing and renovating local hotels and several years of volunteer service on the YMCA board of directors, Economic Development Committee, and the Lompoc Tourism Business Improvement District, Cordova was the public's clear favorite and garnered several declarations of support at the special meeting. Retired Air Force veteran, DUI counselor, minister, basketball coach, and former Parks and Recreation Commissioner Darrell Tullis also received a fair share of support for his message of public safety through youth advocacy and opportunity. Other candidates included a director of nursing, an engineer, a political activist, a former council member, and a runner-up in the 2018 election. At the council's prior meeting on December 18, it opted to fill Osborne's vacant seat by accepting applications and having each of the four sitting council members award points to candidates on a descending scale from their favorite for the job to their least desired. The merits of the top-two point earners were then supposed to be debated by the council before they voted to approve one or the other. That plan fell apart, however, when Cordova earned 39 points and was ranked highest by every council member except Dirk Starbuck (who ranked her second), and candidates Darrell Tullis and Stephen Bridge, a retired engineer and local committee volunteer, tied for second place with 31 points. Rather than debate second-place tie breaker and run-off procedures, the council voted unanimously to let Cordova's clear point lead settle the matter. The city clerk swore Cordova in soon after, and she sat with council briefly before the meeting was adjourned. In an interview with the Sun two days after her appointment, Cordova said the gravity of her new role was still sinking in. "I was really shocked," she said. "We had some great candidates that applied." Although Cordova recognized many of the problems facing the city–homelessness, multi-billion-dollar budget deficits, and the persistently negative perception of Lompoc's overall prospects–she said she refuses to believe in the poor opinion some people hold of the city. "There's a lot of great, exciting things happening in this community," she said. Despite its lack of a major tourist attraction, the city can capitalize on its many, varied experiences to draw visitors and increase revenue, Cordova said. She pointed to skydiving for adventurers, wine country and a gorgeous golf course for leisure seekers, and the city's many murals and flowers for beauty lovers. While she believes tourism will play an important role in turning the city's economic future, she acknowledged that visitors alone won't be enough to solve the deficit. "It would be foolish to say that any one thing will fix the problem," she said. Cordova added that the city will need to find ways to use its current resources more tightly and to attract future development. She said she isn't categorically opposed to raising service fees and fines but that she wouldn't be quick to jump on supporting such moves until all other options had been exhausted. "The people of Lompoc deserve us as council to do our homework and due diligence before we ask them to pay the cost of this deficit," she said. Concerning cannabis, Cordova said she respects and accepts the previous decisions by the council and the public to allow dispensaries, grow operations, smoke lounges, and laboratory testing in town, but added that she will work to make sure the city processes applications fairly and considers the needs of everyone in the community, especially when it comes to approving locations of such businesses. On the issue of homelessness, Cordova said she hopes the city will continue with the support-based approach that has so far been used in the recent effort to clean up the large, long-term encampment in the Santa Ynez riverbed. City officials set up a triage center in September to provide the 100 or so people evicted from the camp with temporary shelter and addiction and mental health treatment. "It speaks volumes about our small-town values that the city and police used a humane approach and showed genuine concern to try and give that community the resources they need to get back on their feet," she said. 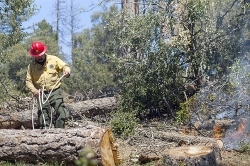 Sun contributing writer Nick Powell wrote this story. You can reach him through the editor at clanham@santamariasun.com.